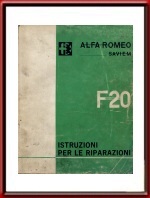 1969 Alfa Romeo F20 Workshop Manual - Original - Italian. Original February 1969 workshop manual for the F20 Van series (Saviem). 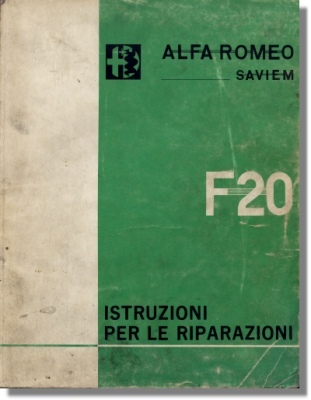 Original workshop manuals from this era for Alfa Romeo are VERY scarce and we are glad to be able to offer your this one which will make working on your F20 so much easier! It measures some 8 x 12 inches or 21 x 30 cm and counts 177 pages with countless photos, drawings & diagrams. Print reference: N. 1381-2/69 - 2500, printed in Italy. Decent condition for its age considering that it is a used workshop item.